Two firefighters stand on the bottom of a vertical ladder carrying a firehose. The second man also wears an oxygen tank on his back. 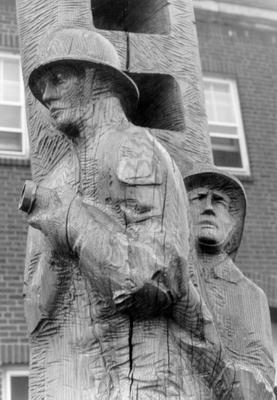 : Norbert Koehn, “Firefighters' Memorial,” Ohio Outdoor Sculpture Inventory, accessed April 22, 2019, http://oosi.sculpturecenter.org/items/show/344.